We’re very fortunate to have a unique gym right down the street from our office, 1 & Only Fitness. It’s co-owned by Mike Lewkowicz and Mike Melloh and has a very inspiring history. Mike Melloh was originally a client of his now-partner and was at the end of his rope both physically and emotionally. He couldn’t lose weight, lived on junk food and was constantly fatigued. He felt pretty hopeless. He reluctantly decided to hire a personal trainer, and in a little over six months lost 70 pounds, completely changed his eating habits and learned to love exercise. The two Mikes became fast friends and ultimately decided to open their own fitness center. Optimal health can be achieved through regular chiropractic care, positive nutritional choices and consistent exercise. 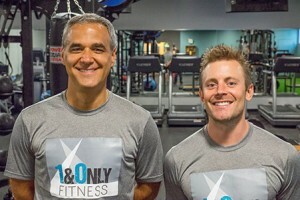 If you’d like to know more about the two Mikes and their philosophy, check out their website at www.1andonlyfitness.com.